Want something different from the traditional dozen red roses for Valentine's Day? How about Rainbow Roses? From 11th February you'll be able to buy these beautiful multicoloured blooms from your local Morrisons* supermarket at a price of £4 per rose, and as they're a limited edition they're expected to be very popular. 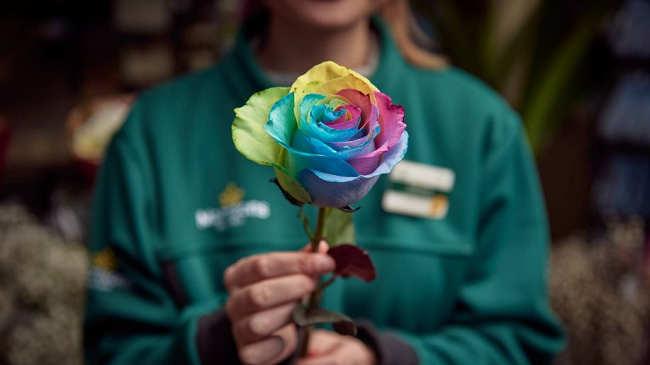 Morrisons* have partnered with LGBTQ+ youth homeless charity The Albert Kennedy Trust to launch the rainbow rose, and 50p per stem sold with be donated to the charity, which provides safe homes and support to young people who identify as lesbian, gay, bi or trans. Morrisons florists have developed these flowers so that each petal displays the colours of the rainbow by using different coloured water to turn each petal into a different vibrant colour - including blue, yellow, green, violet and pink. Drew Kirk, Produce Category Manager at Morrisons says: "We’re stocking rainbow roses this Valentine’s day for the first time. They’ve been designed to celebrate love." You can browse the full Morrisons Valentine's Day selection here*, and Morrisons also have a flower delivery service* if you want to get your bouquets delivered.